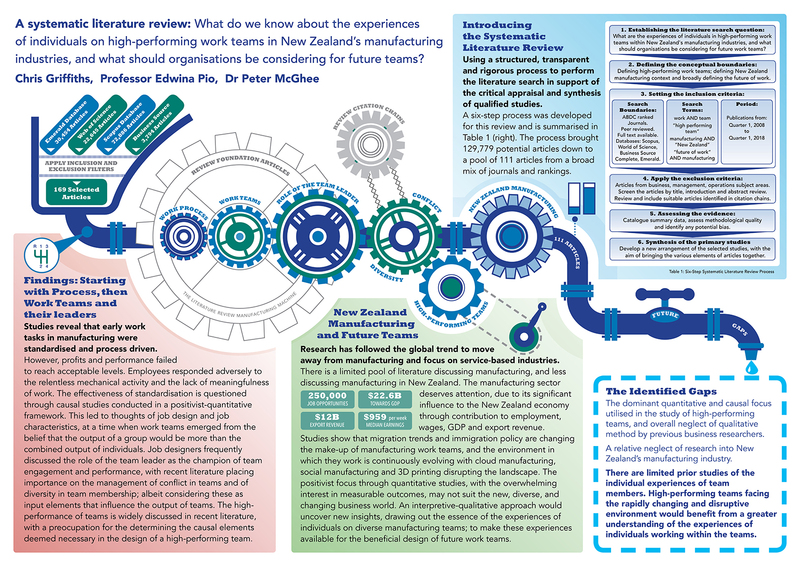 When striving to secure interview participants from some of New Zealand’s largest and most well-known manufacturers, I found it remarkably helpful to draw on material prepared for previous poster presentations, oral presentations, and a 3 Minute Thesis competition. I didn’t realise at the time, but each of these events trained me to form precise, concise and slightly entertaining interpretations of my research. Just entertaining enough for me to gain access to a broad range of organisations from New Zealand’s largest manufacturer, through to New Zealand’s coolest manufacturer (they build rocket ships!). When it comes to precise, concise and entertaining events then nothing beats a poster presentation event. When you stand next to your poster, everything you need to say about your study is right in front of you, and there is the opportunity to engage your audience through clever and memorable design. I have entered 2 posters in different events at AUT, and regularly use the posters to explain my research to a wide audience including my employer, my peers, and (in times of doubt), even myself. Most important is the poster explaining my literature review journey; plainly demonstrating the identified gaps in literature and the rationale for my research. This proved particularly powerful when speaking to organisation executives about securing interview participants. Justification, including the benefit of the study, and any potential downtime for staff, was at the forefront of their decision process. My study is focused on the manufacturing sector, so I for my poster presentation designed a literature review manufacturing machine to show the path to the gaps in literature and rationale for research. This poster proved invaluable when seeking access to interview participants. Some of the more formal events at AUT require the submission of an abstract, usually as part of the event application process. This is yet another opportunity to write a short and punchy script that will prove valuable when face-to-face with the person you need to impress. The bonus is the feedback you receive when you submit the abstract for the event. Even the pass-the-microphone-around introduction for presenters at AUT’s network events taught me something very important: when announcing or introducing my research, don’t use the word phenomenology; it’s too hard to say! Keep it simple, and save the big words for the thesis! The 3 Minute Thesis event is both well publicised, and well supported, by AUT students. The Graduate Research School provides development for the event through drama coaching, as well as connecting you with experts such as voice coaches. My 3 Minute Thesis script, now well committed to memory, became the elevator pitch that has proven invaluable when gaining the attention of those clever, and incredibly busy, organisation executives. This included pitching to roles such as a Chief Science and Technology officer, a Director Strategic Capabilities & Organisational Health, and a HR Director of Global Operations. These executives are often the gatekeepers to interview participants, and gaining access to the next level (downwards), is all hinged on the success of the elevator pitch. It was made clear to me by the personal assistants setting up meetings with the executives – I only had one chance. For one organisation, these meetings were booked for 30 minutes, but I rarely had more than 15 minutes of face time. So, with my poster strategically positioned on the meeting table, my 3 Minute Thesis committed to memory, and guidance from abstracts and network events, I waited patiently for the executive of that day so I could deliver that winning pitch – all thanks to reusing my previous presentation material. As a result, I was able to gain access to staff deep within the often secure and secretive manufacturing facilities. So please don’t ignore that call for abstracts, invitation to networking, poster presentation events or the 3 Minute Thesis. Chances are the material you work on can be re-used successfully, and will be readily available just when you need it the most.